No wait. You "almost" bought them? As in, you did not walk out the door and on to the street after obtaining them through the exchange of goods and legal tender? word verification: "napest"... I just... I mean... I have no idea what that is, but it sounds Not Nice. Dear Blogger, please start using better word verifications. Thank you. Wowza, those are some shoes. Especially the leggo heels. the masculine of the French "chaise", I suppose. In other words, a boy chair. I just want you to know I have a girl crush on you. Those shoes? Those shoes make the world a better place just for existing. Also, I made a cowl dress in your honor. I can't post it yet because I need spanx first, but I never would have made it without seeing yours in that fantastic tea length. My word: wrati. It's the new style of heroin chic. Ratty, but with class. Those shoes are kind of amazing. That heel is so trippy! Word: rubhmand. a very complicated stew that takes 7 days and a full moon to make. 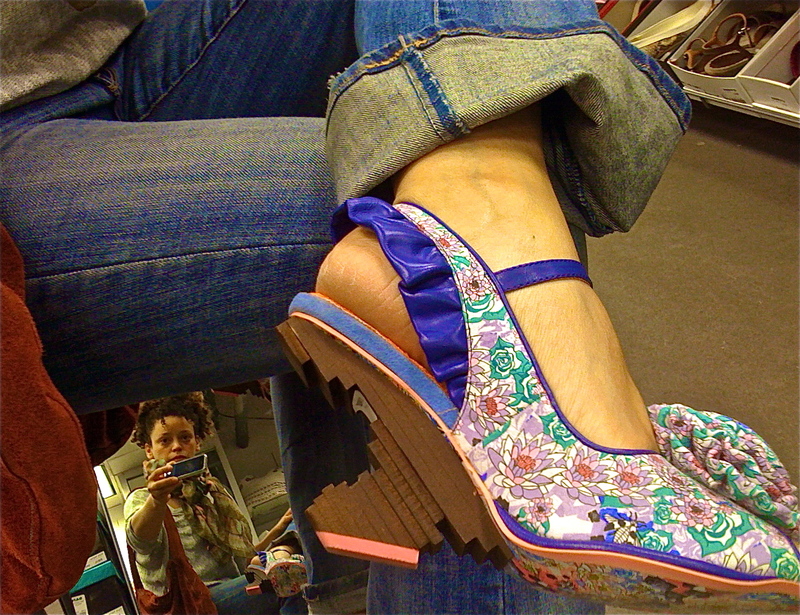 I'm not sure which is freakin' me out more, the actual shoe or trying to get a handle on the mirror image perspective. I'll get back to ya after I finish this beer. Go back and get them! Just for some good stompin' around! "winall" I think that's a metal cleaner/polish??? rr what we should do "win all" like as in the lottery! @Everyone...my word ver is better than yours. CALIPHO. Ah....bah...shhhfft. That was my mind. Officially blown. The heels are in the middle of your foot! How the flip do you walk? I've been studying the photo for ages and can't figure out how the walking happens. But then, the highest "heels" I own are 1" and I still manage to roll my ankles wearing them so maybe I just struggle with the concept of successful walking in general. And that photo... also contributed to my mind being blown. Took me ages to figure out it was both your foot and your face in the same photo! Oh wow. There is so much going on with those shoes. Too fabulous! Also too fabulous: your photographic composition. My Word: comisb. next time, we should co-misb! It'll be cheaper! Not trying to figure out those shoes. I'll leave shoes like that to you. I'm happy with my 1-inch-heeled black vintage-y pair; I can forget about them and just walk, which is what I rather like doing. Word verification: aferk. Small, squeeky-barking dog gone berserk. y'all are KILLING me with this word verification jag. i feel a contest coming on. the pic is me sitting in front of a large mirror, which faces the shoe bench mirror. i sorta tripped myself out when i saw it.